Within the first few pages of SHADOWBOX, Louis Beauregard flees London and a murder he did not want to commit. What would his penalty have been in 1832 for killing another free man? In England, men had been convicted as well as acquitted for deaths committed as the result of a duel. But in Louis’s case, the crime which sets off his escape from London was more serious. He could have faced anything from a stiff fine to death by hanging. English law goes back to the Anglo-Saxon laws of King Alfred the Great. Retribution was one of the great penalties doled out. But Louis’s crime has to be viewed in the conceits of his time, when much of society was very different from today. The death penalty was abolished for theft, counterfeiting and almost all forms of forgery in 1832. For a start, Louis is not a common man. 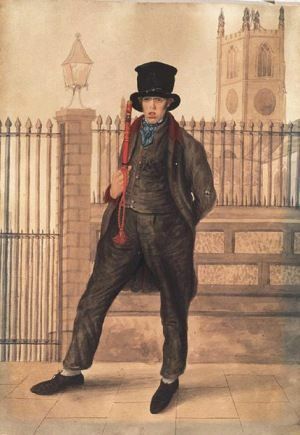 In 1832 he belonged to the cream of society, not quite above the law but with less onerous penalties than an ordinary subject of King William IV. An ordinary man, such as James Cook, received a sentence of death by hanging and subsequent gibbeting of his remains. When the body of the convict had hung the usual time after his execution, it was cut down and conveyed back to the jail, in order that the necessary preparations might be made to carry out that portion of the sentence which directed his remains to be gibbeted in chains. The head was shaved and tarred, to preserve it from the action of the weather; and the cap in which he had suffered, was drawn over his face. With his powerful friends in high places, it’s unlikely Louis would have been hanged. But to a young man, never in trouble with the law before, how could he know? The Metropolitan Police were on his heels. Even as a member of the ruling classes he’d face censure. Not so for lesser men. Minor transgressions, such as theft of food or counterfeiting, ended in transportation. Debtors’ prisons, such as The Marshalsea, so dear to Charles Dickens, were jammed with people waiting to be transported. The journey was hazardous. Many died en route to the colonies of Australia. The infamous convict ships can’t have been a bundle of fun for anyone. Transportation, across an ocean where THE LAST RHINEMAIDEN has influence, terrifies him. He has a hard enough time crossing the English Channel. Of course, what Louis really fears, in Paris as in England, is a death sentence. And the gentlemen of the Cuckoo Club on both sides of the Channel know exactly how that ends. Next in the SHADOWBOX series: Magic Lantern Shows. At least England has had the civility to do away with the death penalty altogether, whereas I have always loved the ambiguity of the Scottish verdict “not proven” and feel we could use a good deal more of here in the good ole’ US of A, as our ideas of jurisprudence have gotten downright peculiar and we seem to have thrown our I, III, IV, IX and XIV Amendments of our Bill of Rights completely out the window; can our sacred writ of Habeas Corpus be far behind? As I understand it from my late father (a smart man) and some classes in AP Humanities or Political Science in university, our legal system was influenced by the Magna Carta signed by King John at Runnymede; and is the basis for all constitutional law in the world. I had to look that up, so that I wouldn’t sound supremely bone-headed and naive, but my father told me much of what he knew and had picked up on his rambles on the Auld Sod before emigrating to the USA. Actually, I think he read all of this in books when he moved here, as he was a young child, and a crofter’s child, so he couldn’t possibly have read all of those things by say, age eight, now, could he? But he and my mother were extremely well-read and they passed that on to me; my mother wrote poetry, which I have no inclination, nor talent to write. My dad read for the pleasure of learning new things and because he loved the sound of the language (a good ear!) Speaking of ears, I caught the Mace piece for viola da gamba on You Tube, as I had missed the window on BBC3, but I do have a new source of music and thank you for that. The thing about the viola da gamba that always endeared me more than any of the other creations of the viol family around that time is the utter graciousness and sonority of the sound, without being lugubrious. I’ve never played one; the bow is held as if one were playing the string bass, and the fingerboard, with it’s sympathetic strings, is likewise, played as a cello, or a string bass would be played. Since I have very small hands (my viola was a true find; 15 7/8″ long, but nearly 2″ in depth, making it fat and tubby, with a huge sound) when I attempt to play the cello, it sounds like “Singapore’s Greatest Hits” with 1/4 tones rampant. I’m hell on a violin, though, where every scale’s note is 1 1/2 tones apart, until my lizard-brain kicks in. I stopped listening to myself on the violin years ago. I’m perfect on the viola, because, me. Mary, you always leave such complex and entertaining comments! Thank you! Glad you liked the Radio 3. Many years ago now, when I worked in the Highlands, Radio 3 was the only station I could pick up. FM radio was scarce back then, and the mountains screened out Medium Wave, but Long Wave was just fine. Radio 4 Long Wave was usually blocked out by Test Match Cricket, so… Radio 3 it was. Maybe that’s how your dad learned so much? Not just reading but listening to BBC Radio? Especially if you avoid the popular music channels, which seem to offer less and less interesting things the older I get. Fogy that I am, hehehe. Umm, I’m not sure you’ll find out more about the justice system of England or France within the pages of SHADOWBOX – it’s more of a personal journey type of story. But thanks for being so keen!